It’s 5:35 a.m. Five-year-old Desmond Morrison waits with his mother for his school bus at the intersection of Lake Forest Boulevard and Bundy Road. The kindergartener’s journey — or his “roller coaster,” as he calls it — takes him all around New Orleans East, onto Interstates 10 and 610, reaching Akili Academy charter school by 7 a.m.
Desmond is one of the many New Orleans students who now travel long distances to school, some with nearly two-hour commutes. Since Katrina, more than half of the city’s traditional public schools have remained closed, leaving many families without a school option in their neighborhood. 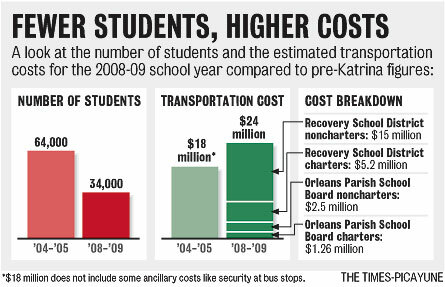 With the emergence of 49 charters between 2005 and 2009, New Orleans became an “open-choice” district where students attend their school of choice, regardless of place of residence. Choice, however, comes with a steep price. The Times Picayune estimates that public schools spent $6 million more this past year in transportation costs than it did four years ago, even though 30,000 fewer children were enrolled. Akili Academy alone spent about $168,000 last year to transport around 90 of its 120 students — a large chunk of its budget that could have been used in the classroom if its student body lived within walking distance. Currently, no Akili students walk to school. It’s not acceptable that children can’t walk to school anymore. How are we supposed to rebuild our communities without having schools that children can walk to? Miss Carter’s article is very interesting. It points out the ineffective use of the students’ time and the school district’s money. We diminish learning when children have such long commutes. There must be a better solution. Hopefully, the writer and her generation will do a better job with public policy than we have.